Party Wishes: Pink Saturday-Tea Time! For my daughter's first birthday, I threw her a tea party. 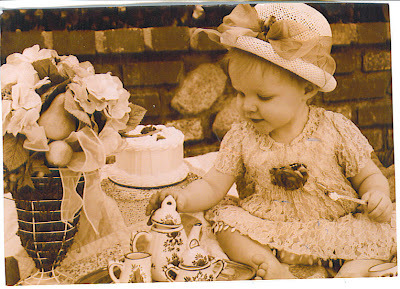 For the invitation, I took sepia-toned pictures of her playing with a tea set. So naturally, we have been helping her collect tea sets- most of them are pink! Now for a tour of the tea cabinet! This is a picture of Sheridan and I at her 1st birthday party. This is a hand painted set with a picture of her first birthday with 4 generations of girls! This is a view of the top of her tea cabinet. I believe the tea set is Franciscan. The picture of the tea pot in the background is made from Sheridan's handprint. The Old Country Roses set matches my own set! How Sweet the Sound hosted by the lovely Beverly! I appreciate each and every one of your comments! oh lucky girl! 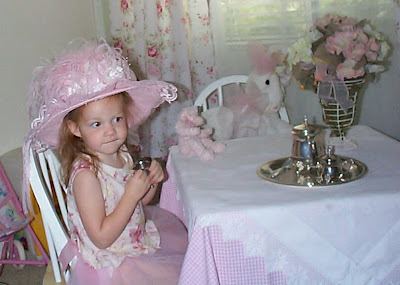 that is such a cute tea party.. and awesome collection of tea sets..happy pink saturday! thanks for sharing. Your Sheridan is a lovely pink princess. I'm giving away 3 free books, so be sure to stop by. Happy Pink Saturday! The old porcelain enchants to me. Pretty celebration you. You and your daughter are beautiful. How wonderful to have your own little one to do fun things for. She is going to treasure these tea sets. What wonderful pictures and memories for you sweet little girl! Happy Pink Saturday! 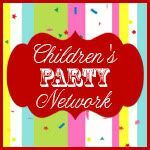 What a sweet party and a precious little girl! My daughter did a pink tea party for her daughter's third birthday. Little girls are such fun! What a lucky little girl your daughter is. Her collection of tea sets is lovely. Thank you for sharing all the lovely photos today. Pretty collection! Happy belated pink saturday! 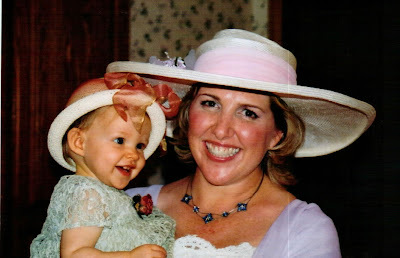 Hi Donna, what great Pink Saturday post pictures! Your Sheridan looks so pretty in pink. I'm going to put on a pot of tea right now!! I adore the pretty little girl teasets. Wonderful!! This was such a sweet pink post, your Daughter is adorable, love all the tea sets. You and your daughter are just beautiful.